The measurement of colour is important in many commercial operations and professions, such as bleaching and colouration of textiles, applications of paints, dentistry and colouration of food products. 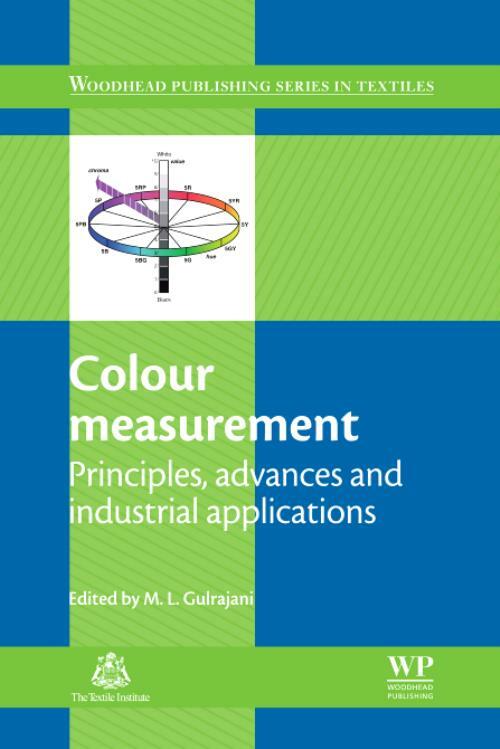 This book will discuss colour measurement theories, the latest technological and scientific developments of measuring colour and the applications of colour measurement. Part one reviews the underlying theories, principles and methods of how to measure colour. It includes topics such as expressing colours numerically, camera based colour measurement, colour shade sorting and determining and improving the accuracy of colour measurement. Part two presents a selection of industrial applications illustrating the use of colour measurement in textiles, paint, teeth, hair and food. With its international range of contributors, Colour measurement: Principles, advances and industrial applications is beneficial to a variety of readers such as colour technologists, colour quality inspectors, product developers, dentists, cosmetologists and anyone who uses colour in their work. It will also be a valuable reference for academics and students studying design, fashion or colour related subjects. Part 1 Theories, principles and methods of measuring colour: Colour vision: Theories and principles; Scales for communicating colour; Expressing colours numerically; Visual and instrumental evaluation of whiteness and yellowness; Use of artificial neural networks (ANNs) in colour measurement; Camera based colour measurement; Colour shade sorting; Determining and improving the accuracy of colour measurement; Colour measurement and fastness assessment. Part 2 Colour measurement and its applications: Colour measurement methods for textiles; Grading of cotton by colour measurement; Colour measurement of paint films and coatings; Colour measurement of food; Colourimetric evaluation of tooth colour; Hair colour measurement. Gulrajani, M. L.Dr M. L. Gulrajani is a Professor at the Indian Institute of Technology in Delhi. He has undertaken more than 50 consultancy projects from various textile industries, published over 150 research papers, edited 24 books, including conference proceedings and has four Indian patents. He is a fellow of the Society of Dyers and Colourists (UK), the Textile Association (India) and is an Honorary Member of the Association of Chemical Technologists (India).